Two days ago, I "quick pickled" some strawberries with red wine vinegar and agave syrup and my Dad thought I was crazy. I ate them on a salad with blue cheese dressing. Strawberries are more versatile than you think. They are great with vinegar, sea salt and more. 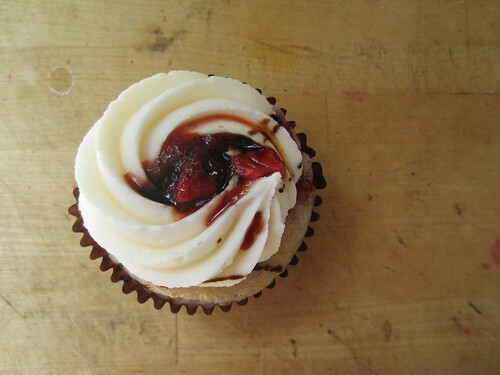 I spotted on a Flickr a photo of Strawberry Balsamic Cupcake made by Jen Angel of Angel Cakes. This cupcake is the June cupcake of the month from Angel Cakes. The strawberries are California strawberries from Swanton's Berry Farm near Santa Cruz. Angel Cakes offer their Cupcake of the Month subscriptions with dairy or vegan, and if someone asks really nicely they will make a gluten free version.